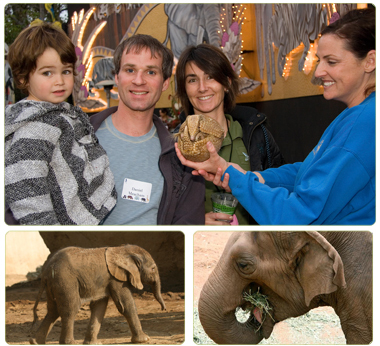 President’s Patrons are a distinguished group of Zoological Society supporters who help provide new programs and facilities that lie at the heart of all that we do. President’s Patrons are true visionaries, who are part of the fabric of the Zoological Society’s future. Their annual generosity makes our ambitious commitments for the animals a reality. One adult with two accompanying guests OR two adults in the same household with four accompanying guests. Unlimited Zoo Bus Tour and Skyfari® at the Zoo for you and up to four accompanying guests per visit. Free parking at the Safari Park. Unlimited Africa Tram at the Safari Park. VIP invitations to exhibit dedications. Special Member Appreciation Day at the Safari Park. Special early hours at the Zoo — In recognition of your contribution and participation in the President's Patrons Club, you're invited to enter the Zoo early from 8 to 9 a.m. the second Saturday of each month. Kudu Connections newsletter with unique stories and information. WildPerks™: Show your membership card and get 15% off food, merchandise and more! President's Clubs activities throughout the year. *Each President’s Patrons member receives a personalized membership card for unlimited admission to the San Diego Zoo and Safari Park along with two accompanying guests, per cardholder, per visit. Please note that the estimated fair market value of President's Patrons benefits is $403.